Free lotus flower hair tattoo design stencil. Nape undercut design hair tattoos are fashionable, easy to hide and great to show off when it suits you. The downside is that they can be fairly tricky to pull off from a design perspective. Clean, smooth lines are important and it takes skill to create that perfect look. However, at Royal Etch, we like making things easy for you. With our free resources, you can focus more of your energy on being the creative, bold #royaletchartist you already are. This lotus flower nape undercut design stencil has been designed and sized to fit nicely on the nape area of the neck. 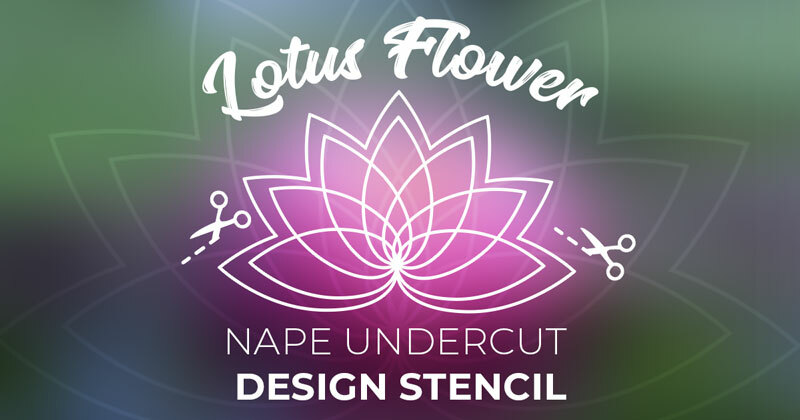 Begin the process by cutting out each of the lotus flower stencils included in your template. Take the large lotus flower stencil that you cut out and center it in the nape of the neck area. Use your white eyeliner pencil to trace an outline of the entire flower. Take the medium sized lotus flower stencil center it in middle of the large lotus flower. Use your white eyeliner pencil to outline the medium sized flower. Take the lotus flower petal stencil center it in middle of the medium sized lotus flower, which is there to help make sure all of your angles align perfectly. 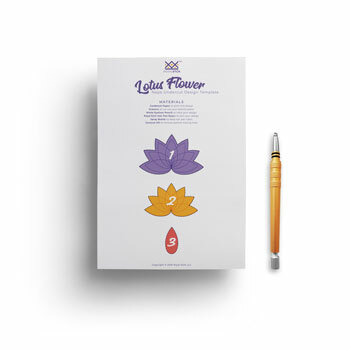 In other words, the top of the lotus flower petal should align with the points of the medium sized lotus flower. Use your white eyeliner pencil to outline the petal, rotating the stencil until you have traced all 7 petals. After you have traced your nape undercut design completely, you are ready to start etching! Use your hair pen to etch directly over the traced lines. In that case, you will need the Royal Etch hair pen. Find out more here. Here’s few things to keep in mind while you etch your nape undercut design. Use the spray bottle filled with water to clean your hair etching pen during the etching process. This will help keep the micro razor sharp and streamline the process. Use coconut oil or makeup remover to remove the eyeliner tracing lines once you are finished. We recommend using coconut oil as it will also help to moisturize the recently etched nape!